Safety and shelter are never enough for children and youth in foster care and the juvenile justice system. The Youth Law Center advocates to transform foster care and juvenile justice systems across the nation so every child and youth can thrive. KNOWLEDGE of the law, research and the facts on the ground. INTEGRITY to do what is best for our clients regardless of financial or social consequences to ourselves, and to be deserving of the trust of our supporters and clients. COMMITMENT to pursue solutions urgently and relentlessly. RESPECT for the individuality of children and families and their potential to thrive, and respect for the efforts of those who strive to serve them. Our work aims to ensure children are not only protected from harm and dangerous conditions, but also receive the support, opportunities and love they need to grow up healthy and happy. 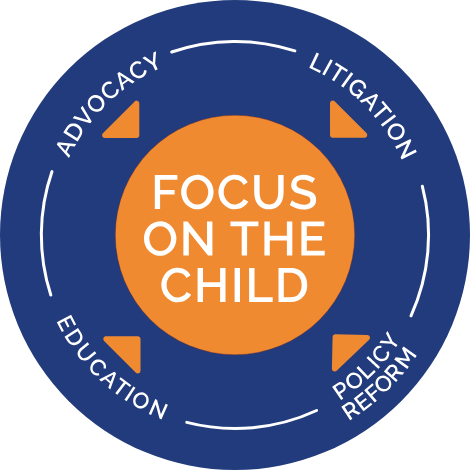 For decades we have led the field to transform systems to be truly child-focused and research informed through litigation, policy reform, media advocacy, collaborative system change projects, training and advice, and public education. The Youth Law Center is committed to sharing advocacy resources, information, and tools that can improve the quality of life and opportunities for youth in foster care and the juvenile justice system. Our goal is to strengthen the field through knowledge, and increase the impact of those who are working on change for our children and youth. Justice for children is in loving parenting. When children are not with family, there must be a sense of urgency to ensure they are receiving the love, nurturing and support every child needs and deserves. Join us in fighting for justice for children and youth in the foster care and juvenile justice systems.